CCAO is a leading manufacturer and distributor of bags of all sorts for a vast array of industries. 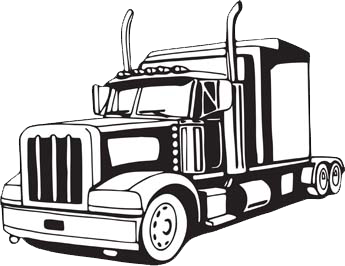 We have been custom building all sorts of bags locking and non-locking for the transportation-trucking industry for years. 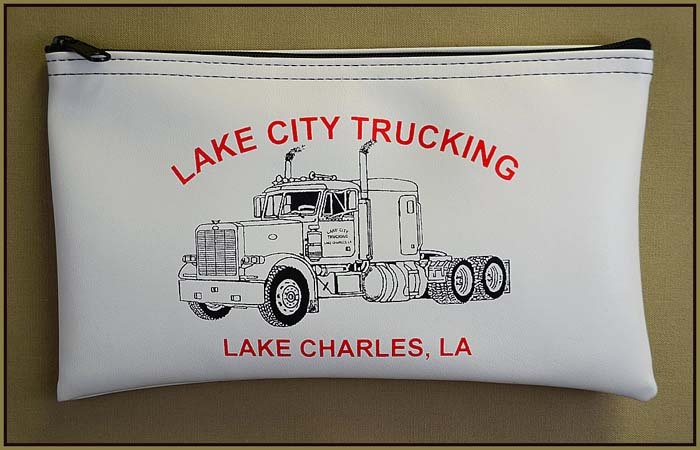 Whether you need specialty bags-pouches for transporting mail, locking bags for your courier drivers, or just cab bags for drivers to store/organize their papers, logbooks, maps, etc. - we can make it and have done it before. 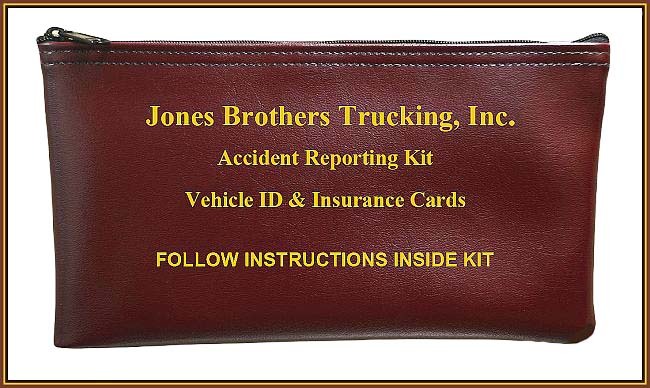 We have also been producing Accident Reporting Kit Bags for trucking fleets across the country. 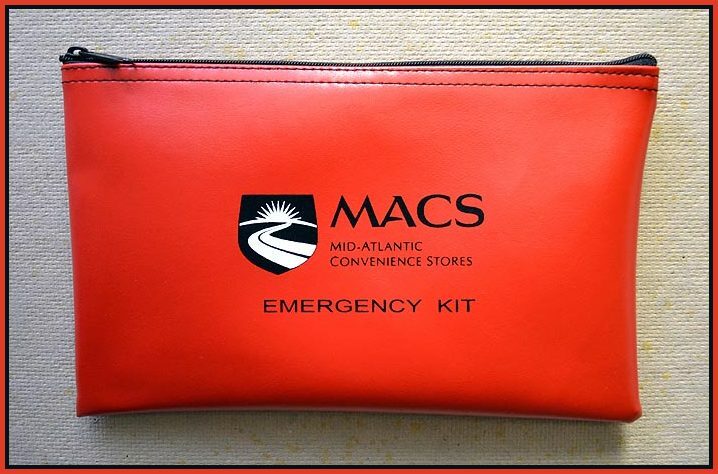 We have gotten so many requests for providing an entire ready to go kit, we have decided give in to popular demand and offer various reporting kits options for our ever growing requests for this style bag and our products. Whether you have 3 vehicles or 300, having an accident report kit readily available that contains the proper papers and forms in order when needed can be invaluable!!! These style bags are extremely useful for keeping all the necessary papers and documents that may be required by insurers or company policy in the event of a motor vehicle accident. 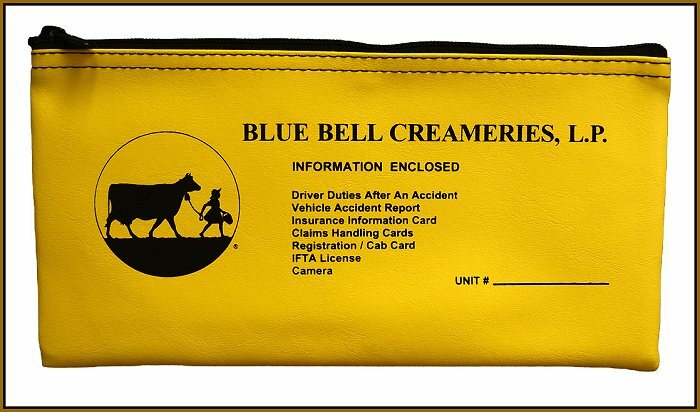 They are small enough to keep in almost any glove compartment but big enough to accommodate things like disposable cameras, papers, forms and insurance cards as well as log books. Of course the use is NOT just limited as an "accident reporting kit" but can be used for storing log books, maps, manuals, fuel cards etc. They are made from expanded vinyl which is very easy to wipe clean and offers a good degree of protection from things like rain, moisture or spills. These bags, as all of our products, can be made in any size you require. We can also print your company name/logo and/or any information you would like. We can also add a clear framed window which allows you to slide a card inside for vehicle identification. Having dealt with individual owner/operators to huge trucking companies of all sizes, their needs and requirements vary from mandates that may be imposed from insurance companies to internal policy from risk management operations. Whatever documentation a company may require for a driver to have on board on his/her rig, we can make the bag to accommodate those needs. You got things like maps, manuals, first-aid kits, driver logbooks, to gas receipts, we produce the bags to put these items in. Regarding your requests for any bag you may need, we have a variety of different fabrics and colors to choose from. Call us with your task at hand and will tell you how we can help you. The answer to your problems may be a telephone call away. We will tell you quickly whether we can help you or not. We thank you in advance for your consideration.! A. You can have us make any size bags you need and we can build them for you. You just tell us the size of the items you wish to place inside and we will suggest the correct size bag and give you fabric options that would yeild you the best results in the most cost efficent way. You can have these bags screen printed or embroidered with one or multiple colors with your logo and any other wording you desire. Of course these bags will be priced according to size, fabric choice, complexcity and quantity. B. 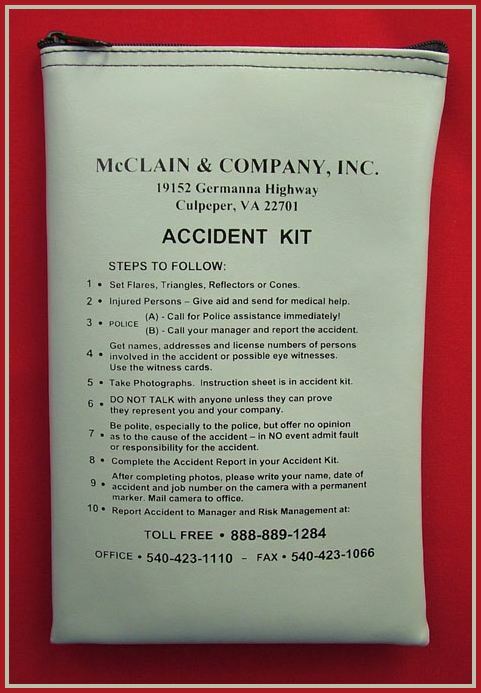 Our stock empty pre-printed 11"wide x 7"high Accident Reporting Kit Bag. You of course put inside the required items to suit your needs. 1-12 Bags 13-24 Bags 25-36 Bags 37-75 Bags 76-100 Bags 100 plus CALL! C. Our stock pre-printed 11"wide x 7"high Accident Reporting Kit Bag with 15 exposure disposable camera w/flash, notepad, pen and valuable 10 point check list. D. Our stock pre-printed 11"wide x 7"high Accident Reporting Kit Bag with 15 exposure disposable camera w/flash and valuable 10 point check list accident reporting form, witness cards, and pen. 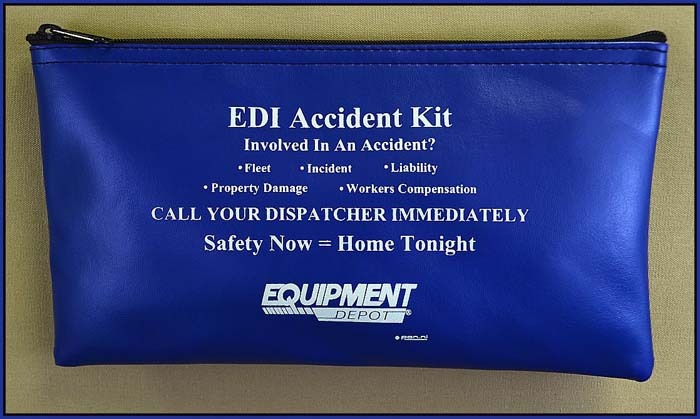 E. Our DELUXE package comes with pre-printed 11"wide x 7"high Accident Reporting Kit Bag with 15 exposure disposable camera w/flash and valuable 10 point check list accident reporting form, witness cards, 2 pens, notepad, copy of Part 382.303 Post Accident Testing, 9 inch clipboard. 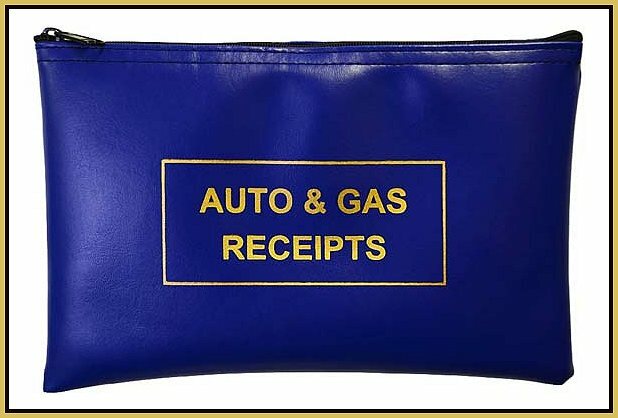 We also stock a textured expanded vinyl Auto & Gas Receipt Bags. The stock bag measures 11 inches wide by 7 inches high. A great bag to have on hand to store and organize various receipts and papers that one may aquire in your travels. BLACK - BURGUNDY - DARK BLUE - HUNTER GREEN - RED - TEAL - WEDGEWOOD BLUE. As with all of our bags we can make any size needed. Below are some larger pictures of just a few of the bags from the thousands of companies we have manufactered bags for. Hopefully this will give you some ideas and serve as a reference point. 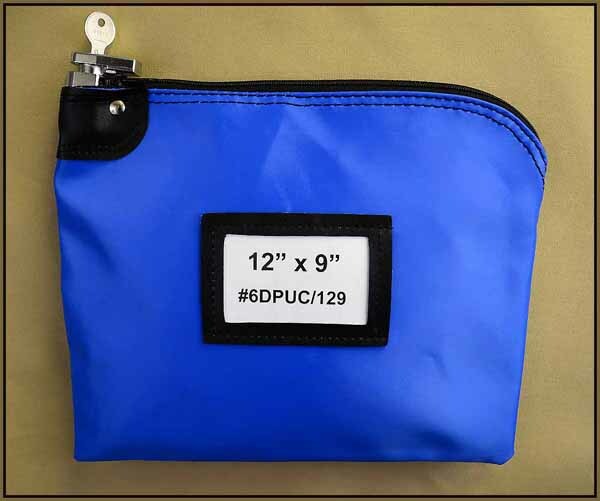 This is our #6DPUC/129 High-Security locking zipper bag. It measures 12"w x 9"h. Overall this is the most popular size bag for general use from banking to personal items. We have many pages dedicated to locking bags exclusively. 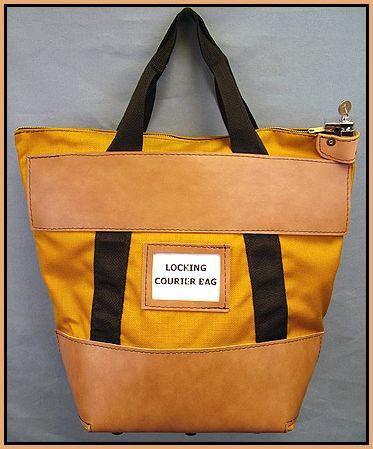 There are two links below that will take to to pages on our website that will have much more specific information on these and other styles of locking bags. This is our HDLCB heavy duty bag. It is one of our many high-security locking courier bags, This bag here measures 18 inches high by 18 inches wide at the top. It is 8 inches deep at the bottom. This bag has 2 inch poly webbing handles making this bag ideal for carrying heavy loads. We have four stock sizes and can be made in many colors. For more detailed information and other courier style bags click on the link provided below and it will take you directly to that page. For small orders for or an individual operator we can personal a bag with his/her name using our HOT STAMPING process. Using that process would elminate a screen/plate charge. For more information on that click on link below.